Daisy and Diesel are back again. And this time, they've added Harvey to the mix, which could lead to something rather interesting. But how will A Most Singular Engine stack up after yesterday's (near) perfect start? 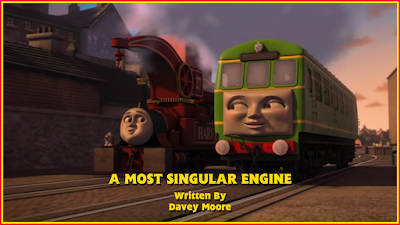 Character development isn't a process that ends after one 9 minute episode, especially for a character like Diesel. This seems like something fans have forgotten, or are simply ignorant of. Percy's took a whole special and an episode, James' took years in the books and two episodes last series. Diesel's too will be a lengthy process, especially since he's learning important lessons about friendship. Fact is, as much as the Steam Team feels one note and indistinguishable when they're together (more often than not), there are lots of different personalities that Diesel will have to adjust to - him with Duck will be the most intriguing prospect. That's something that can't be contained in an episode, but it's more an overarching narrative throughout a series. It will be interesting to see how many episodes they'll give his development, but the last episode and this have set brilliant groundwork to expand upon. There are a couple of quibbles with this episode in particular, which I'll get to in a bit. But the overall story is excellent. Diesel's frustration with Daisy's personality is easy to understand, especially since the team did a good job showing how overbearing she could be. It also showed how well Diesel's deviousness could be used to further his development. It could get old quickly though, so they'll have to find the right balance of how often it comes into play. Or, at least, think of more unique ways to implement it since they did such a good job here. Another aspect the team did a brilliant job with was utilising a plot about rumours. It helped that few characters were used (the more characters you use, the more the plot crumbles. Unless you do a good job incorporating each one in a believable way, something the team had struggled with before), but the choices made sense. Diesel since he'd want to spread conflict, and Ryan because he's still rather naive. Harvey's inclusion was fantastic too. It made sense and his interactions with Diesel and Daisy were fantastic. His mellow, laid back personality was really nice, and him saving Diesel showed how big of a heart that he has. It led to the overall message really well. 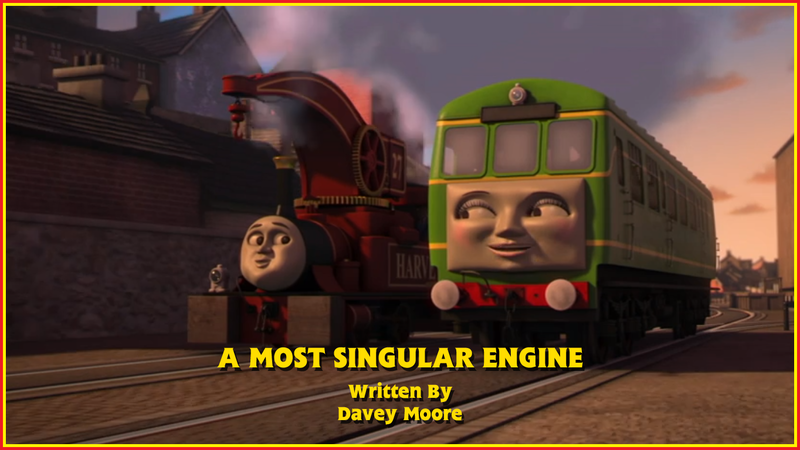 Granted, another engine could've been used - and I'll mention who in a sec - but Harvey was a fine choice as well. Going back to Diesel, I honestly rather liked, and understood, his motivation. Could it have been made stronger? Yes. And, to be honest, including Hugo would be a brilliant way for him to get the revenge he wanted after she implied he wasn't unique. But it made sense to me nonetheless. If you met someone who was a bit full of themselves, you'd probably want to bring them down a peg or two as well. And the best way for Diesel to do that, and feel a bit better about himself, was to try and show Daisy that she wasn't the most unique engine. I also liked the theme that different people can be friends so long as you get to know them. It's something that's essential for children to learn, especially since adults can barely grasp that concept. Now, the drawback: the toilet humour. I'm fairly ambivalent to its inclusion in the franchise... so long as it's funny and it has a place. Whether this instance was funny or not is up for debate. But what it is is completely out of place. It damages the tone completely, and tries to make light of an engine spewing sparks out of his vents and breaking down. Why they couldn't just say "my undercarriage!" I do not know. Think of it this way: how much of an impact would Hurricane's melting scene have had if he'd have said something like "my bottom's on fire?" rather than the much more harrowing, memorable "I'm melting!"? There's more urgency, panic and it became an instantly recognisable line. Here though, there was no such impact, no such urgency and no such memorability. If they want to add humour, of any kind, fine. But ensure it adds to a scene rather than detracting from it. And that makes two stellar episodes with Diesel and Daisy at the helm. While it was rather stupid that they constantly mentioned Daisy by her full title practically every time she was on screen, and calling Diesel's undercarriage his "bottom" because kids find backsides funny really annoyed me, there's very little complaint about the things that matter. The story was great, Diesel's motivation made sense, it was funny, the theme was brilliant and the characters remained top notch. I really don't have much to criticise that isn't nitpicky, so it can only really get one rating.